Time for Healing bridges the gap between alternative medicine and modern clinical practice, showing how increasing evidence supports the validity of acupuncture, herbal medicine, aromatherapy, and naturopathy. It proposes ways to safely and intelligently integrate these complementary therapies into modern health care. Individuals will find valuable guidelines for seeking qualified practitioners and reliable products. Health care professionals will learn ways to broaden their practices and improve patient satisfaction. As communities, hospitals, and insurance companies are beginning to recognize the cost-effectiveness of complementary therapies, Time for Healing gives real case histories that point out dangers as well as benefits of integrating alternative therapies into traditional health care. 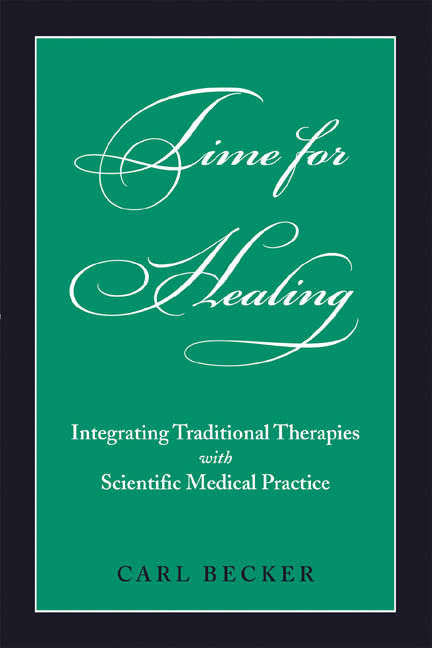 "This book is well-written and timely.… It would make a great text for an overview class on complementary alternative medicine (CAM) for conventional medical schools." CARL BECKER earned a Ph.D. in Comparative East-West Philosophy from the East-West Center at University of Hawaii. He is Professor of Comparative Thought and Medical Ethics at Kyoto University, researching ways that cultural views affect healing and terminal care. He is a founder of the English Forensics Association, International Association for Near-Death Studies, and the Japan Mind-Body Research Association.